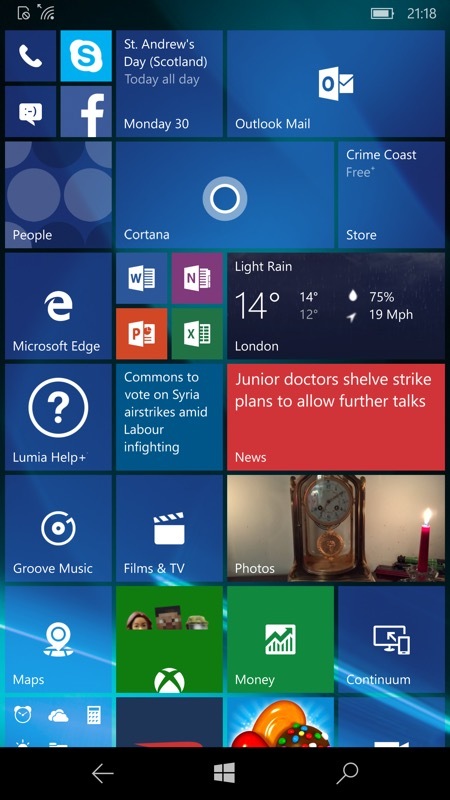 News, reviews, information and apps for Windows Phone. The next generation of Windows Phone is here, in terms of software and hardware, in the shape of the Lumia 950 XL running Windows 10 Mobile. 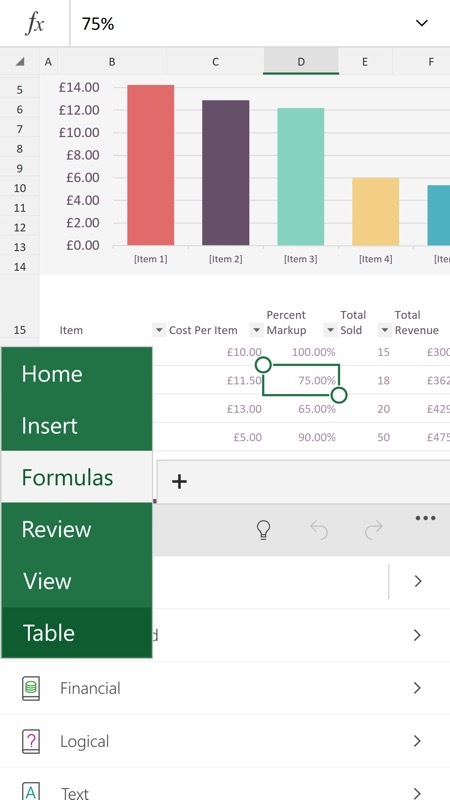 Now, we've covered the software side of things here ad infinitum on AAWP over the last year, thanks to the Insiders Programme - and almost everything here works identically to the Insiders preview builds on the likes of the Lumia 930. But there are some new tricks, everything's faster and - most of all - we have genuinely competitive hardware to run it all. Arguably for the first time in Windows Phone's history. This is part 1 of our full review, see also the 950 XL photo gallery published a couple of days ago. Part 2 will be cross-device, since the two 950 devices have the same camera, and will cover imaging in all its forms, with some comparisons, while part 3 will also be cross-device and will cover Continuum and other unique aspects of these new devices. Watch this space! 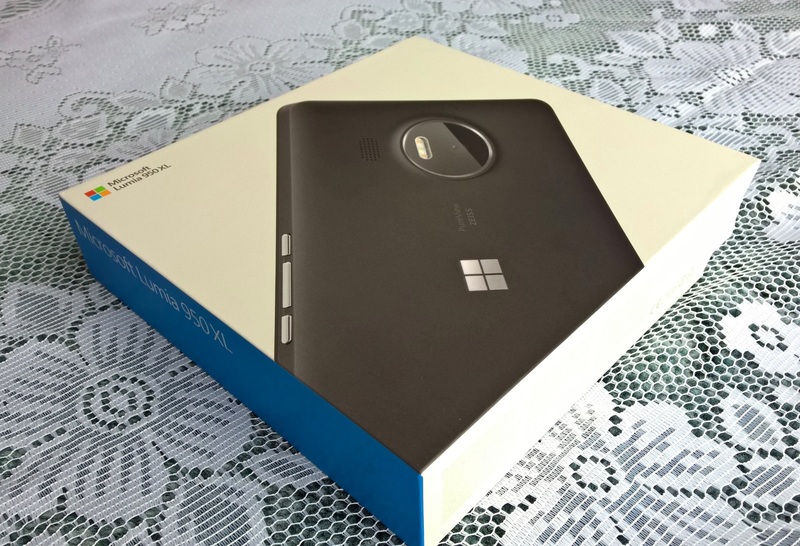 My benchmark, the 'bar', if you like, for my Lumia 950 XL review, is the Lumia 930. And, to an extent, the larger (though quite rare) Lumia 1520, both of which I've had lots of experience with. The Lumia 950 is arguably the upgrade for the 930 and the 950 XL for the 1520, though in reality both the two new flagships sit in between the older pair. 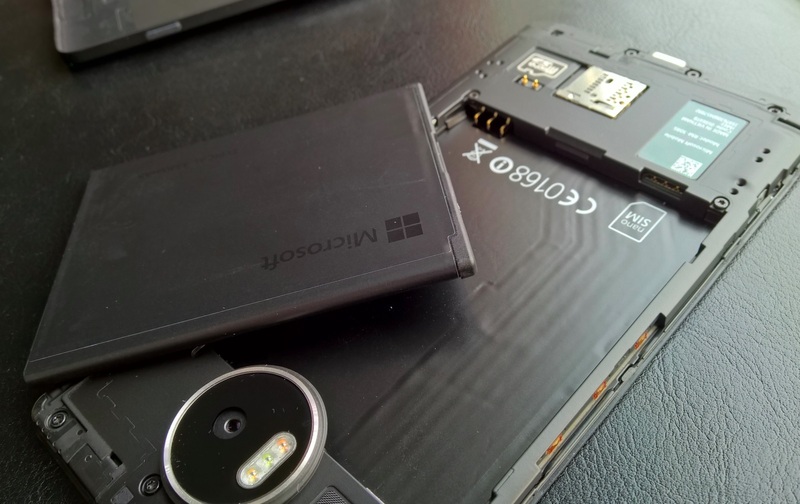 Much of what follows will apply to the cheaper and smaller Lumia 950, of course, the internals are almost identical, but this review is explicitly about the 950 XL, the top of the range and the one that I conjectured that most people will want to plump for. Though before you start hitting any 'Buy' buttons do note that, having had prolonged hands-on time myself, the 950 is undoubtedly the more friendly, the more pocketable device, and is fully usable one-handed, something which you can't really say about the 'XL' version. Pros and cons all round in terms of form factor and I'll return to this in my upcoming review of the Lumia 950. Cutting edge specs AND flexible? The 950 XL sits well alongside the large-screened competition, including the iPhone 6s Plus, the Galaxy Note 5 and the 'Galaxy S6 edge+' - and, for once in the Windows mobile world, the specifications are right up there. A Snapdragon 810 processor (with liquid cooling), 3GB of RAM (which is a lot for Windows 10 Mobile), 32GB internal storage plus that microSD capability. Then add in NFC, fast LTE, Qi wireless charging and compatibility with Qualcomm’s Quick Charge 2.0, and it’s hard not to start to be impressed by the sheer, 'everything but the kitchen sink', scale of the tech that Microsoft has thrown at the 950 XL, and all this from the company that’s been insisting on stripped down budget hardware for two or more years! Regular readers will know that for years I’ve been a fan of hardware that allows the battery to be swapped - so many regular users hit issues with under-performing, degraded batteries after a couple of years (or after an accident). Being able to simply buy a new battery and pop it in is a huge boon. Add in the potential flexibility (if you’re an uber geek or road warrior) to keep a charged spare in the car glove box or briefcase and your smartphone effectively gets a new lease of life. Facilitating this, the whole back section of the 950 XL pops off, showing the battery slotting in very neatly underneath the edge of the camera island. While down the bottom is a welcome microSD slot, again a flexible nicety that often slips out of fashion in today’s style-led phone world. So you don’t have to choose a specific memory capacity ahead of time - just buy a card with the capacity of your choice and slide it in. Of course, with a removable back there's bound to be some loss in solidity - although the 950 XL's back clips on very securely, pressing on several spots on the back cover (the bottom corners are the worst) induces an annoying creaking noise. This is typical of this sort of design in early production and is usually fixed at the factory for subsequent runs with a foam insert on the inside of the back cover. Plus, by necessity, the side buttons are just loosely held caps in the back cover over the real (stub) buttons on the phone's body underneath, meaning that they can be moved from side to side - they don't rattle in daily use - just be aware that they're not as rock solid as on previous Lumias. I for one am happy about the compromises overall, though I'm sure the niggles above will annoy some, especially after paying £500 or so. Let's hope that the review units aren't fully representative of production 950 XLs that will arrive in shops over the next few months. 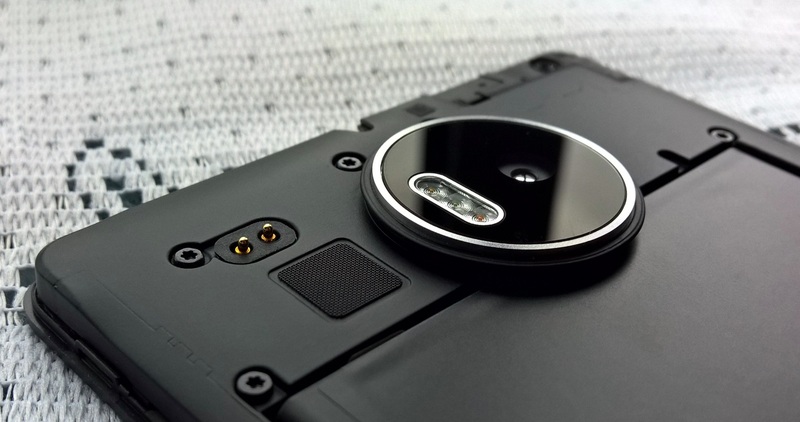 The camera island on the back is styled in the manner of the Lumia 830 and 1020 and the visual identity does give the 950 XL some credibility when taking snaps of someone else. (Of course, under the plastic circle is the usual rectangular module, but somehow no manufacturer has ever dared expose this shape!) The triple LED flash is evident and, as we shall see, impressive in operation, though with one caveat, mentioned below. Next to the camera is the grille for the mono speaker. This seems to be the same component as on the likes of the Lumia 640 XL (which shares quite a few aspects with the 950 XL) and is similarly loud but fairly tinny. There simply isn't room for a decent speaker chamber on these modern phones, at least not for positioning on the back, so the bass is almost non-existent. Having said that, it's perfectly loud enough and clear enough for the spoken word, i.e. sat-nav, podcasts, speakerphone duties, and so on. The 5.7" QHD screen is cutting edge, and with the usual ClearBlack Display polarisers, sunlight readability enhancements at the pixel level, Glance screen, Gorilla Glass 4, and you can tweak its colour profile in Windows 10 Mobile's Settings, as we've come to expect in the best Lumias. I found that that contrast wasn't quite as good as the display on the Lumia 950 and can only put this down to the different level of Gorilla Glass, but we're only talking of a percentage point or two, don't worry. I did find the display a little colder and more neutral than I'm used to with AMOLED, but everything seemed tuned perfectly when set to 'Vivid'. As usual with my Lumias, where available I set Glance to 'always on' and as usual there's no significant drop in battery life. 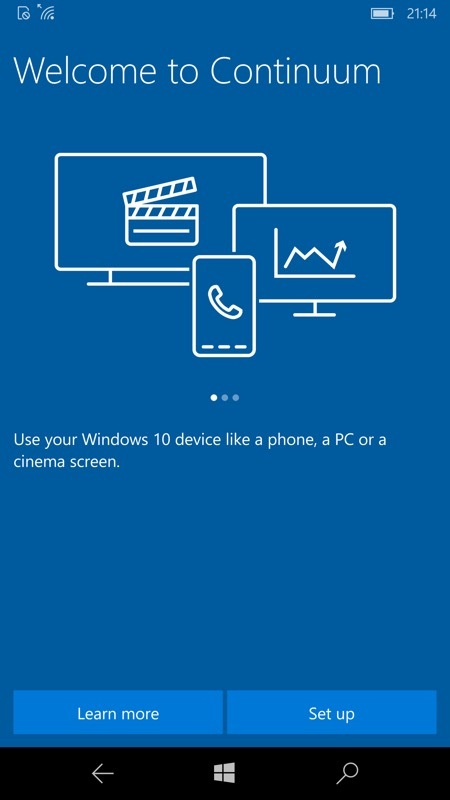 Just set and forget, and this remains a distinguishing factor and unique selling point for the Windows Phone and Windows 10 Mobile handsets. The startup sequence, restoring from a previous backup and use over the first few hours are smooth enough as long as you have a little patience. The usual Wi-fi setup, language selection screens, and so on, are well known by now and Windows 10 Mobile Build 10586 is pretty stable. However, there's still not enough explanation, in my opinion, for the way the first hour of the new buyer's experience will be peppered by live tiles and applications which aren't 100% available, essentially, as they update and install in the background. I switched over to the Store application quickly and counted over 40 applications, which install two at a time, though at a fairly low priority in the operating system. So a new user wouldn't notice a sluggish phone, especially given the mighty Snapdragon 810 processor - but I'd still like an initial pop-up explaining what's happening. 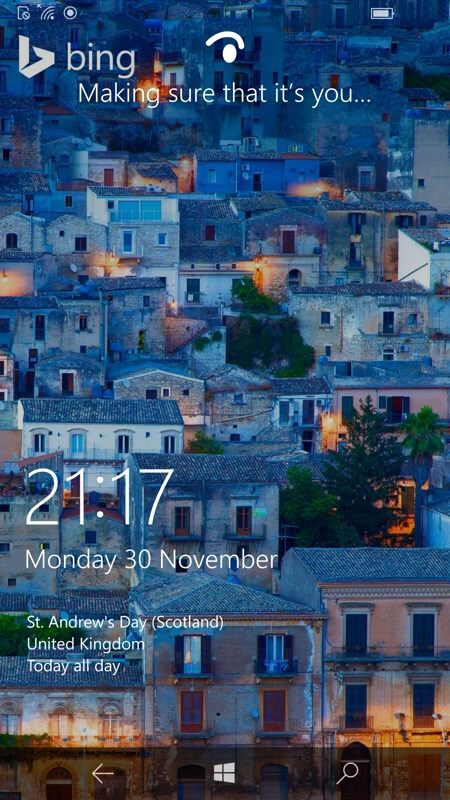 Getting set up on the Lumia 950 XL - here I've taken the default tile layout, flicked the 'Show more tiles' toggle on in Settings and then rearranged things just a little to fill the display. As with the 1520, it's possible to have an amazing amount of information and access on a single screen, here at 5.7". 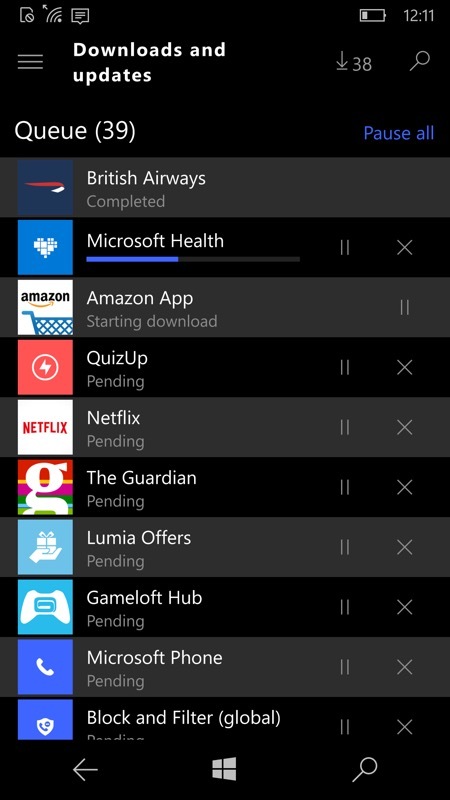 Note that some of the live tiles haven't yet kicked in with updates (Cortana and Outlook, for example); (right) the backlog of updates that the phone has to work through after being turned on for the first time! Once running, signed into Microsoft's cloud, and with all apps and updates under your belt, the Lumia 950 XL runs beautifully. Well, I say that - nothing is really any different, complete with the odd bug and quirk here and there, to the same Insiders Build on the likes of the Lumia 830, 930 and 1520 - it's a work in progress, as is Windows 10 on the desktop, perennially up for updates and patches now. But the point is that there are precisely zero stutters. Games which struggled a little with frame rate on older Lumias ran smooth as silk. 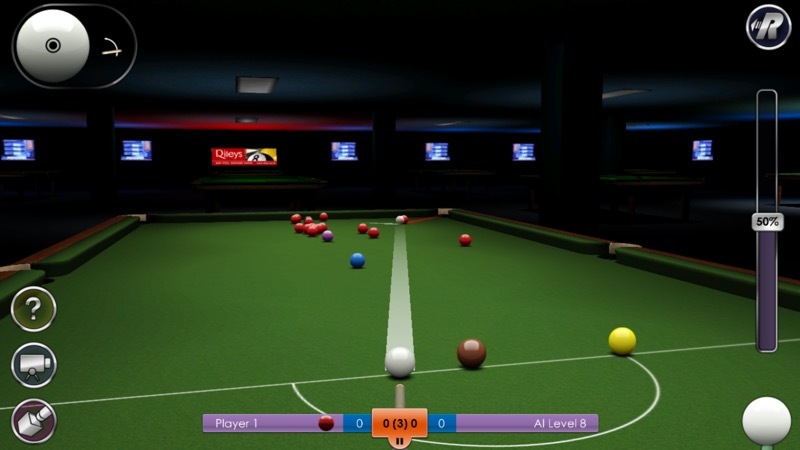 My favourite International Snooker Pro is a good test case. On the the Snapdragon 400-powered Lumia 830 it's essentially unplayable, even with the rendering quality turned down, on the Lumia 930 it works some of the time but I've lost count of the number of times some background process or agent slows the frame rate by a factor of two and the balls lurch around drunkenly. On the Lumia 950 XL, the game is perfect, with high resolution renders and action as smooth as on the best Android smartphones. 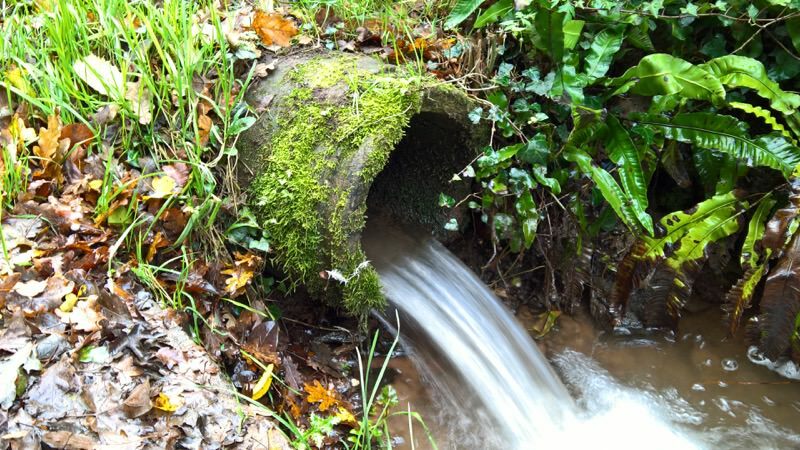 Obviously, there's more testing needed after weeks and months of cruft and daily use have taken their toll, but things look good so far. 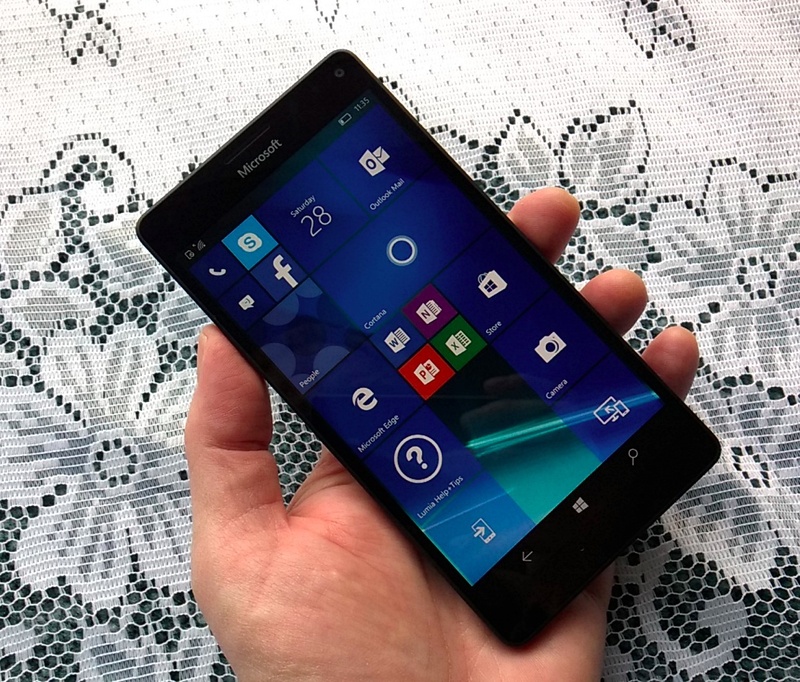 The Lumia 950 XL is a true mobile computer, as you’d expect with ‘Windows 10 Mobile’ as its OS out of the box. Complete with a file system and File manager application, Type C-hosted USB 3.1 (you can hook up hard drives, memory sticks, and so on, of which more in a future tutorial), Microsoft Office (shown below), Microsoft Outlook, the new Edge browser, and evolutions of some Nokia favourites from the past, including Windows 10 Maps with the 100% offline worldwide navigation, still a unique selling point despite Google Maps' recent steps in this direction. And all of which work better on the large 5.7" screen than on any other Windows Phone before it, even than on the Lumia 1520, which is slower and with lower screen resolution. Plus ‘Continuum’, of course, covered much on these pages, plugging in a large-screened monitor as a secondary display via the optional Microsoft Display Dock, and hooking up a mouse and keyboard (also wired directly or via Bluetooth). Any universal applications (Office, Outlook, Maps, Photos, Groove Music, and many, many more) are then able to take over the extra display at its native resolution as if you were using a traditional Intel-powered processor inside a PC case. It's a neat trick and deserves its own review coverage - not least because we don't have the Display Dock in the UK yet as I write this and because neither of my wireless TVs support Miracast. Sigh. So I'll come back to Continuum another time. Nokia/Microsoft sat at the top of the imaging tree in my eyes with the astonishingly good (and annoyingly slow and quirky) Lumia 1020, complete with Xenon flash and huge sensor, but the competition, in the shape of the LG G4, Galaxy S6 and iPhone 6s have arguably caught up in terms of everyday imaging. The Lumia 950 XL manages to match the late 2015 competition and then eke out a little extra, in the shape of triple-LED flash, of which more in a moment - this doesn't claim to win out against Xenon on a proper camera, but it does get remarkably close when combined with the large f/1.9 aperture and 2015 sensor. The LEDs are all coloured and 'tuned', with the camera's electronics firing them in response to what it detects about the scene being shot. Well, that's the theory, anyway. For still life shots it works brilliantly, with results that have the same colouration whether lit in daylight or by this super-natural LED flash unit. When snapping human subjects, the multiple flash sequence used tended to make people blink on the first flash and so I’ve now got lots of photos of faces with eyes squinting or completely closed. Hopefully the timing and intensity of these flashes can be tweaked in a future update. 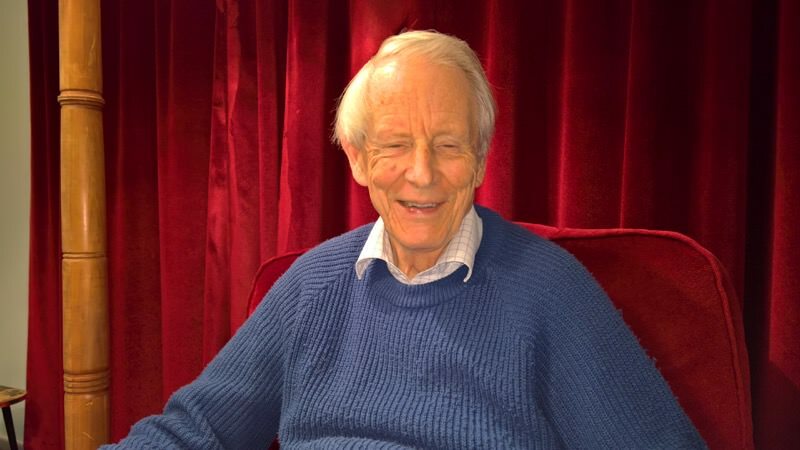 My 80-year-old dad, this photo is typical of the dozens I've taken with the triple-LED flash on. Eyes automatically squinting after the initial 'probing' LED pulse - Microsoft needs to analyse lighting and colours at focus time, I think, then leave a single LED pulse for taking the photo - and worry about removing 'red eye' later on! I have to (sorry!) mention Xenon flash here, in that it's now clear that there's never going to be a direct replacement for the Lumia 1020 and that the 950 range is therefore the best we have. The larger aperture and better sensor, plus the triple LED flash unit all help produce decent shots in social situations, but there's still some blurring where people's hands or faces are moving. It's not enough to make the camera unusable, but it's still enough to make me want to use a proper flash. Sigh. I'll have more examples of this in part 2 of the review, looking at imaging. So, we have an industry-leading flash, a large aperture and optics, 'fifth generation OIS', a large 1/2.4" sensor, and a fast processor to back it all up. Natively, 16:9 shots are at 16MP, though I preferred to run in 8MP oversampled mode, since this corresponds to a 4K monitor, and so why would anyone need higher resolution? It works really well, plus there’s the familiar PureView ‘zoom’, effectively smart cropping into the sensor resolution to lose oversampling, but maintaining the full 8MP detail. In fact, as with other 2015 flagship cameras, there’s enough spare image processing power to add a couple of levels of interpolated zoom too, taking the degree of usable zoom up to 4x. At least, for that 8MP output, of course - if you leave the 950 XL on its 16 or 20MP settings then it’s in the same boat as the likes of the Galaxy S6 (etc.) cameras in terms of usable zoom. 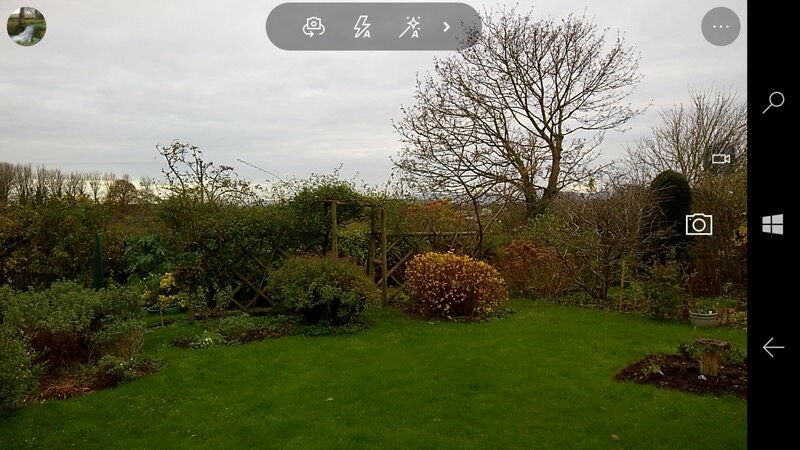 Rich Capture, blending automatically-taken multiple shots of the same scene, works brilliantly when it’s available, though it's worth noting that on older Lumias this was an on-off setting. With the Lumia 950 range, Microsoft added intelligence so that it doesn’t kick in if the algorithms in Camera don’t think you’ll get any benefit from the feature. This can be a little disconcerting for users of older Lumias, though the benefit is that more efficient use of the phone’s storage and other resources. And, as a result, you can leave Rich Capture set to its 'Automatic/On' setting all the time, i.e. you don't have to think about it when taking a photo, which is a huge boon if you trust the algorithms. Notice the new 'A' indicator on the Rich Capture 'magic wand', indicating that even when 'on', it's really on 'automatic'. Which is fine, it's less to think about when shooting. Ditto the auto-flash. Just leave the Camera algorithms to decide what to do! Well, you can leave it on all the time if you're shooting still life - shooting people is another matter - people move between the shots, but also you'll be wanting to review snaps quickly, to check expressions, and the 'Adding finishing touches' background rendering is then frustratingly slow, even on the new processors here. More on this in part two of this review! In theory there’s a new mode too, ‘Dynamic Exposure’, taking two exposures in poorish light to help freeze moving subjects while keeping the background at higher quality. This didn’t help much in my tests (I did several), though it’s early days, both for the review device and for Windows 10 Camera, which is now being updated on a weekly basis. Video capture’s 4K, of course, this being a 2016 flagship, and the ‘capture stills’ function works brilliantly to extract 8MP shots from any footage. My main use for this is at sports events and birthday parties - in each case, you can’t predict the exact magic moment - a touchdown, blowing out candles, etc. So just relax and shoot the action in 4K video and then go back later, while relaxing, and pluck out any frames you like as a high resolution photos. If there's any one big trend in smartphones in 2015, it's been the addition of biometrics - using some physical aspect of your body to authenticate you - to unlock you quickly without you having to enter a PIN, meaning that it's much more practical to leave your device 'locked' all the time, away from fellow workers, family member and various miscreants. And, potentially, to act as authentication should you wish to buy something in a physical shop in the future - we've seen Apple Pay, Google Pay, Samsung Pay (and others), but not - yet - Microsoft Pay, though surely something like this can't be far off? As it is, biometrics are only used here for in-app and Store purchases. 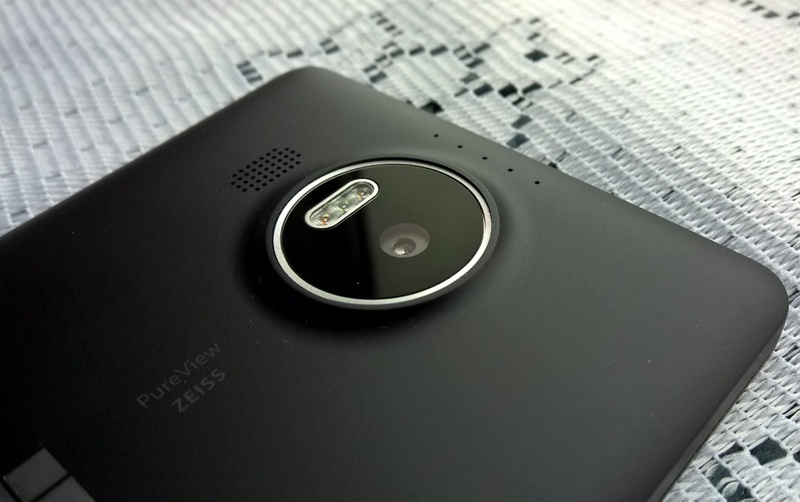 For the Lumia 950 range, Microsoft has chosen to go with iris recognition rather than fingerprint scanning. 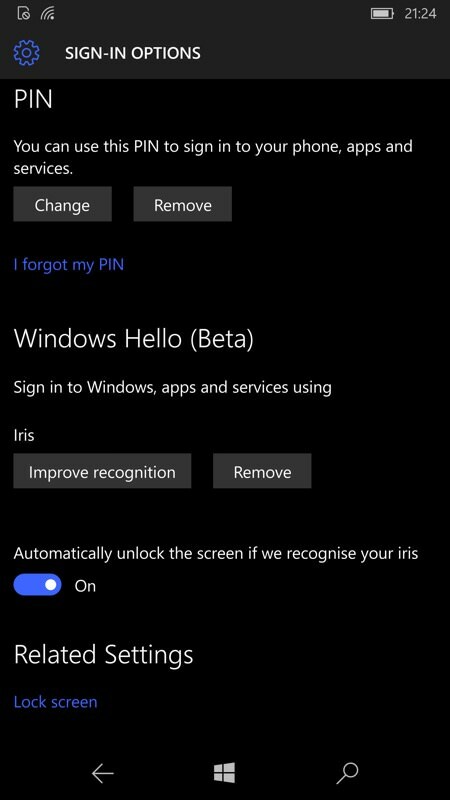 The resulting ‘Windows Hello’ system does work - you power up the lockscreen, your iris(es) are scanned and then you’re authenticated and in, bypassing the need to enter a PIN (for example). 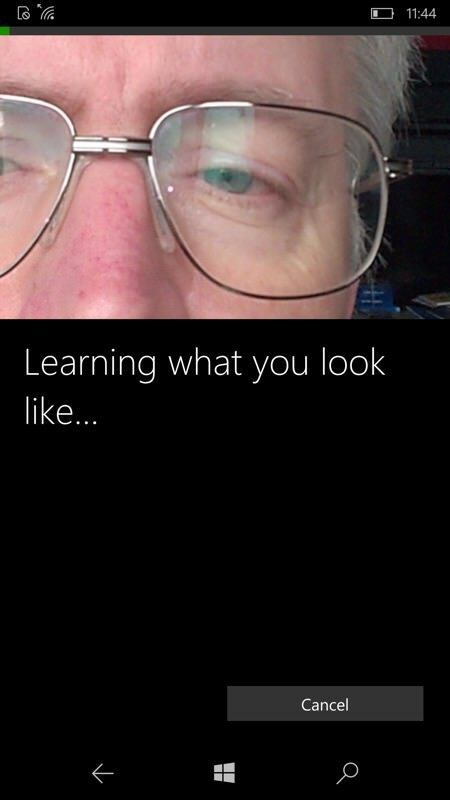 However, in real world use, Windows Hello takes much longer to work (typically around two seconds, even after you’ve lifted the phone up to your gaze) and (understandably) doesn't work at all well if you wear glasses (like me) - and yes, I did try the 'Improve recognition' function. Given that competing phones with fingerprint scanners can unlock the device in a tiny fraction of a second (think instantaneously) even while you’re lifting the device out of your pocket or up to your gaze, the iris recognition feels very slow indeed. I ended up setting the 'Sign in' options to '15 minutes', i.e. the maximum time-out, after which you have to authenticate again - this would be a decent compromise in a typical office or travel situation, though as I work at home most of the time, I just set it to 'never' and thus only have to worry about entering a PIN or taking off my glasses for the iris recognition when I want to buy something on the device. Talking of fingers, I can’t finish without a mention of the slightly odd button arrangement on the Lumia 950 XL - in a nod towards the ‘phablet’ form factor, and to make things easier to reach, the power button is in between the two volume buttons - something I don’t think I’ve ever seen before on a modern era smartphone. It’s confusing at first, though I did get used to the layout. The main Windows Controls are are now virtual, following the modern trend across the industry and following successful use of the system on the budget Lumia 640 and 640 XL earlier this year. I hated them at first on those devices, but once you get used to the flick up from the bottom to hide or show the controls, the system really is more flexible. It allows the bottom bezel on each device to be smaller than for capacitive controls and for the available display real estate to be larger when needed, such as playing a game, viewing photos, watching a video, and so on. Calling the Lumia 950 XL 'uninspired' is accurate, though gives a somewhat misleading impression. 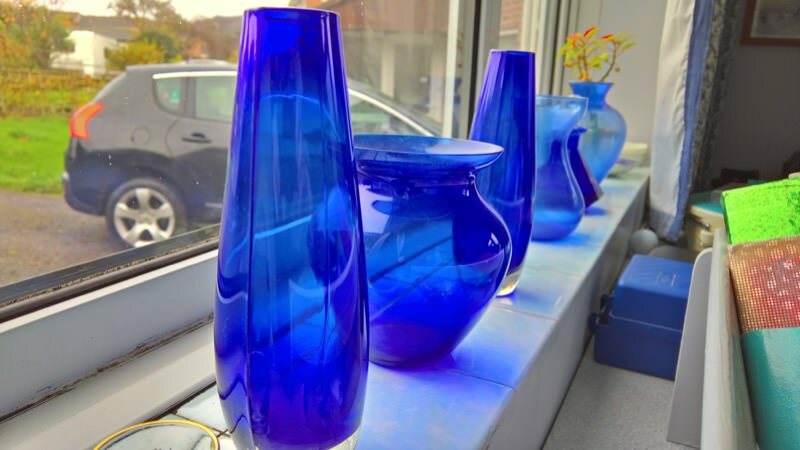 It's certainly true that the physical aspects - the plastics, the creaks, the totally flat glass, the choice of only black or white - feel immediately less premium than almost anything else on the market at the same (circa £500 in the UK) price. But the components used throughout are top notch, and all that plastic does yield great flexibility in terms of battery and storage. Most of all, the 950 XL (and the 950) are a quantum leap in terms of performance and overall capabilities in the Windows Phone world. The Lumia 930 was a flawed device (everything sealed, no Glance, overheated at the drop of a hat), the 1520 was a monster that no one could pocket, plus even these were two years old and badly showing their age. And everything else in the Windows Phone sphere was another level down again. Yes, regular users might not notice too many issues with the likes of the Lumia 640, 735 and 830, even once they've been upgraded to Windows 10 Mobile, but tech enthusiasts reading the likes of AAWP will be wanting more, especially given the insanely competitive world of smartphones at the moment. I'll come to the Lumia 950 in due course, but I wanted to cover the Lumia 950 XL first because it's the flagship, with the fastest chipset, the liquid cooling, the bigger screen, the Gorilla Glass 4 protection, the bigger battery. Here's a two word summary: "Stunningly competent". Which sounds a bit like an oxymoron, but it's true from the perspective of a Windows Phone user from the last four years, most of whom will make the journey up to Windows 10 Mobile by some means or other. For them, the Lumia 950 XL is by far the best device ever to run the OS - it's a pleasure to hold and use (creaking aside! ), the core applications and third party stars work brilliantly, and the USPs of the improved imaging and Continuum are the icing on the cake. Of course, from the point of view of someone with an iPhone 6 (onwards) or Galaxy S6 (onwards) or Sony Xperia Z5 (onwards, you get the idea, I could extend this list quite a way), the Lumia 950 XL hardware isn't as exciting as it perhaps needs to be, plus it's absolutely true that the third party application ecosystem for Windows 10 Mobile has gaping holes in it when compared to iOS and Android. Microsoft's aim though, as already discussed, isn't to sell tens of millions of these things. The Lumia 950 XL is their 'Nexus', their demonstration device of how Windows 10 can work in a mobile context. So Office, Outlook, Continuum, Hello, and so on. The hardware itself is very capable but there's no real 'halo' effect. That will come in 2016 with Microsoft's first post-Nokia flagship, but don't hold your breath for that one. If, as an AAWP reader, you like your smartphones with bigger displays, then you could do a lot worse than invest in the 950 XL right now. There's one big caveat to all of this, of course, and that's the state of Windows 10 Mobile itself. The review Lumia 950 XL was demonstrably not free of bugs and stability issues, do watch the site front page for news of updates, patches and major fixes as we head into 2016 with 'Windows 10 as a service' and the programme of 'continual improvement'. PS. Plenty more review parts and features to come, plus a review of the smaller Lumia 950 which - I have to confess, despite the slightly reduced specification - is perhaps the more solid, more convincing choice, and certainly the more manageable and pocketable! Thanks very much to Clove for the loan of the retail devices used in these features! All About Windows Phone provides an independent source of news, reviews, apps and more to the Windows mobile ecosystem. Get in touch: Contact Page, Email, Twitter or Facebook. This website is not in any way endorsed by Microsoft. Windows Phone and all Windows Phone marks and logos are trademarks of Microsoft.